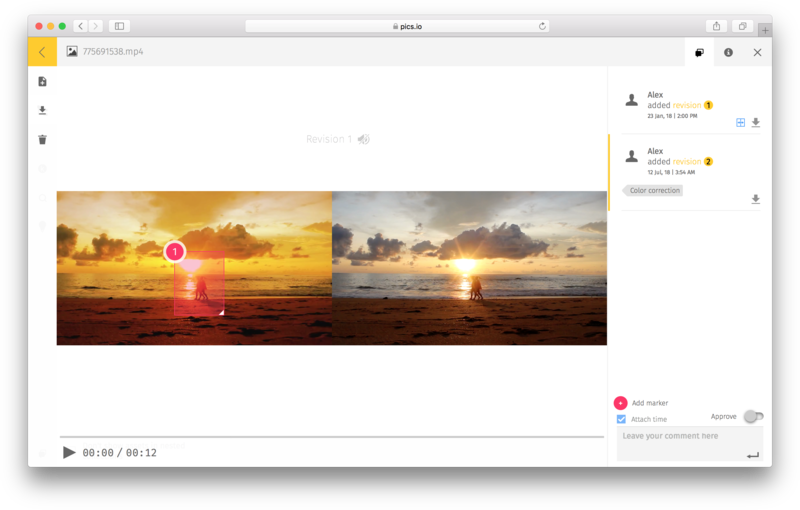 In the same way as you can discuss static images (such photos or sketch files) by leaving comments, putting markers, and highlighting areas of interest, you can also do the same with video assets. How can I leave a comment to a video file? Select a video you want to discuss. Just start writing your comment, and the video will stop automatically and “wait” for you. When you finish your comment, you can press “play” to continue watching the video. If you leave a comment like this, it will refer to the whole video file. But if you want to leave a timestamp comment about a particular moment in your video, make sure you tick the box Attach time above the space for leaving comments. The time will appear next to the comment, so your teammates will know which moment in your video you’re talking about. How can I highlight a specific place on the screen and leave a comment about it? If there’s a particular place on your video that you want to comment, you can use Timestamp Markers and Areas of interest. To add a timestamp marker, click on the pink button above the space for leaving comments. This will create a marker that you can put wherever you need on video and leave a comment. Every time you put a timestamp marker on your video, the time is automatically attached to your comment. You can create as many markers as you want. They are numbered, so you will not get confused. An eye-looking button next to the marker in the Activity panel has to modes (open and closed). It allows you to hide the markers from the screen. Every time you select an area of interest on your video, the time is automatically attached to your comment. So your teammates will easily understand which moment in your video you were referring to. Besides, all the comments, markers, and areas of interest are reflected as gray bullets above the timeline. They act as “bookmarks” that automatically take you to the corresponding places in the video.